There is a reason Thorzul's blog is titled the way it is: he rules! I recently won several of his latest auctions on eBay. See, after my last giveaway, I am a little short on cards in some areas, so I figure this way I can accomplish many things at once: 1) I help out a fellow blogger by putting a little change in his pocket, 2) I can slowly rebuild my giveaway stash, and 3) I can do it in such a way that it does not raise too many alarms. Okay, the last one is a joke. When I got home to find a box from Milwaukee, Wisconsin, I had a pretty good idea who it was from. And when I opened the box to find a hefty stack of Tribe cards in addition to another hefty stack of cards I bought, I knew for sure! Thorzul Rules! 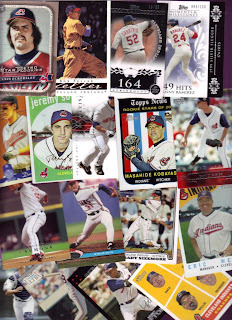 There are a bunch of Tribe cards that he sent along to me and they cover all kinds of makes: Topps, Upper Deck, Fleer, SP, Bowman, Select, and more. Plus a variety of models: Topps Heritage, Fleer Patchworks, UD Reflections, Topps Own the Game, UD Diamond Connection, Topps Opening Day, UD Play Ball, Topps Co-Signers, UD Star Retro Rookies, Topps Gallery, Topps Moments & Milestones, UD Goudey, and the list goes on. 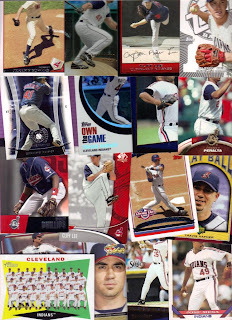 There is a large number of Moments & Milestones featuring Sabathia (each card showing a different Moment/Milestone and serially numbered), Thome, Hafner, Ramirez and more. It's weird seeing the same photo used on so many 'different' cards. I gotta hand it to Thorzul. I was very surprised to find all these cool Tribers in my shipment of eBay winnings! Awesome stuff! Thank you VERY much!